Cut 2 pieces of rod 1 inch longer than the ear. 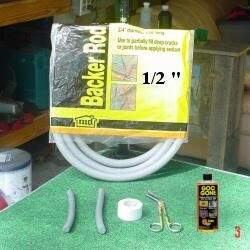 Spiral wrap rod with tape, when you reach the end, twist tape at the end of the rod and back wrap with sticky side of tape out. Cut 5 strips of tape for each ear. Cut the first strip at 1 1/2", then each additional piece a little longer than the prior piece. Clean and shave the inside of the ear before taping. Insert wrapped rod into bell or base of ear gently twist down to make sure it is to the bottom of the bell or base. Pull the ear up taught and affix tip of ear to the rod, then press remainder of the ear to the rod from tip of ear to base. Using the 1 1/2" piece of tape, wrap tip of ear to rod leaving just a small amount of the ear tip showing. 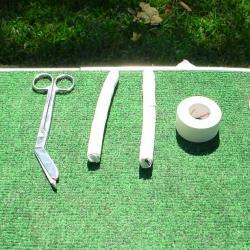 Place the tape around and then press tape with your hand to prevent taping too tight. Place the next to longest piece of tape on the rod at the ear fold. Hold fold in place and wrap tape so the fold is securely in place. Place the tape around and then press tape with your hand to prevent taping too tight. Use the next two pieces of tape to wrap the rest of the ear. Once all the tape is in place, cup the ear in your hand and press the tape against the ear. I cannot stress this enough, DO NOT PULL TAPE TIGHT WHEN WRAPPING EAR. Pull wrapped ear up taught. Using the longest piece of tape, make one last wrap at the base of the ear while holding the ear up. Pulling up on the ear and holding it taught while taping the base keeps the end of the rod from popping out, and helps strengthen the muscles used to hold the ear up. Place thumb over ear tip for protection, THEN cut off excess rod. BEFORE you CUT Make sure tip of ear is COMPLETELY covered with thumb!! Excess rod is ok - a missing ear tip is not! Place a small strip of tape over the cut rod end (careful not to cover the ear tip) to prevent rod from coming out. 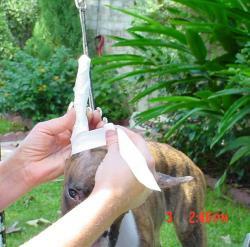 The first couple of times you wrap, the edges of the ears may still have some places not completely healed. If so, once you have secured the tip of the ear to the rod, pu triple antibiotic ointment on those areas, then tape remainder of ear. Keep ears wrapped for 5 days and down for 1 before re-wrapping. IMPORTANT! 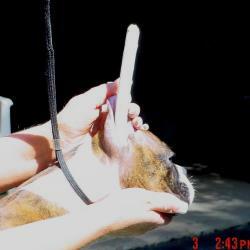 Check the ears daily for oozing, bleeding and unpleasant odors, this could be a sign of trouble. If any of these are present, remove the tape, clean the ear edges with hydrogen peroxide and apply triple antibiotic ointment. Allow the ear to air for one day before re-wrapping. 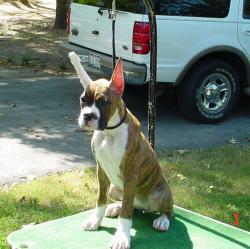 If redness or swelling is present, do not re-wrap ears and consult your veterinarian. 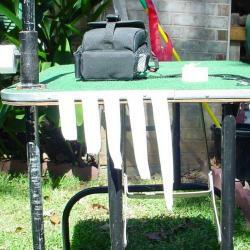 Sensititivity to tape adhesive may require an alternate method of wrapping. Ear Wrap Removal: Using bandage scissors, place the blunt tip of scissors just under the tape at bottom of ear outside of the ear fold. 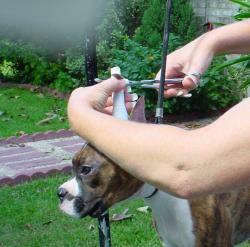 WITHOUT cutting, lay scissors on side with cutting edge away from ear fold. Taking caution not to cut the fold in the ear, snip tape all the way to the top past the tip. If the scissors will not move under the tape in some sections, grasp sides of tape that are cut and tear the tape, then give the scissors another try. Making sure the tip of the ear is unwrapped, gently roll back the tape from sides of ear, pull rod out at base and gently pull the rod from the ear.